There are no doubt many ways to invest and I’ve tried many. Some of the most successful investors use a value investing framework. The value framework also has a huge advantage in that some of the most successful value investor in the world including Warren Buffett and his partner Charlie Munger graciously and willingly share how they do it. That in itself makes a case for value investing as does the references below. Equally surprising however is how few seem to listen. Although value investors may use varied approaches and have different styles there are common tenets that most follow. The best place to start is with Benjamin Graham the author of Security Analysis and The Intelligent Investor. He is considered the father of value investing; Warren Buffet’s professor at Columbia University and a very successful investor. Warren Buffett is said to be Benjamin Graham’s first and only A+ student. For decades Warren Buffett continues to graciously share the lessons of his teacher and friend Benjamin Graham along with the enhancements he and Charlie Munger added over the years. Can a method from 1934 be applicable today? Below are three sources that make a compelling case for value investing in my view. First: The Brandes Institute answers the question through their ongoing research. They built on the original works of Dr. Lakonishok (Univ. of Illinois), Dr. Vishny (University of Chicago), and Dr. Shleifer (Harvard University) study of Contrarian Investment, Extrapolation and Risk from 1968 to 1990. Brandes Institute extended the study to June 2010. They concluded for a broad range of definitions of “value” and “glamour” (their term for growth or in favor stocks), value stock consistently outperformed glamour stocks by a wide margin. The original and subsequent studies incorporated a variety of definitions of value and glamour, the researchers classified stocks using the following criteria: price-to-book (P/B); price-to-cash flow (P/CF); price-to-earnings (P/E); sales growth over the preceding five years; and select pairings of the previous variables. There were three basic steps. (1) The sample of companies as of April 30, 1968 was divided into deciles (each group with 10% of the companies) based on one of the value criteria (2) The aggregate performance of each decile was tracked for each of the next five years on each April 30. (3) The first and second steps were repeated for each April 30 from 1969 through 2010. The pattern of substantial value stock outperformance continued. 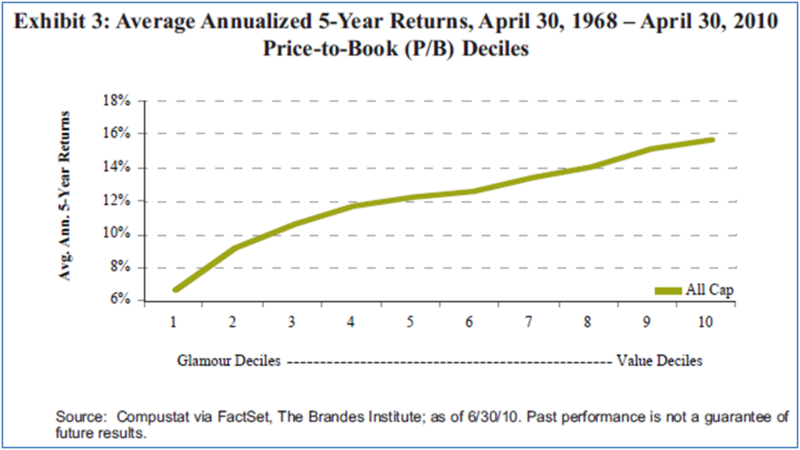 From 1968 to 2010 period, decile 1 the glamour stocks averaged an annualized 6.5% return versus decile 10 the value stocks with average 15.6% return. Respective cumulative performance equaled 37.3% and 106.1%. Exhibit 5 illustrates our global all-cap findings across the three price metrics reviewed and once again the results showed a value premium for measures used. You are encouraged to read the complete White Paper and and other worthwhile reading at The Brandes Institute excellent site here. Second: Tweedy, Browne Company’s publication What Works in Investing is a compilation of 50 different studies conducted on the subject. It is their attempt to share with investors their knowledge of historical successful investment characteristics and approaches. Various value investing parameters were tested against other investment strategies and indexes. The results compiled in What Works in Investing are impressive. Tweedy, Browne concluded in part that: In Tweedy, Browne’s experience, contrary to some proponents of the efficient market theory, it is possible to invest in publicly traded companies at prices which are significantly less than the underlying value of the companies’ assets or business….It can only be stated with certainty that many studies have repeatedly shown investment in numerous groups of bargain securities over very long multi-year periods has produced excess returns. Tweedy, Browne 92-year history in value investing is interesting. Benjamin Graham was one of Tweedy, Browne Company’s primary clients for decades and through him the original partners did business with investment legends Walter Schloss and Warren Buffett. Their investment approach is derived from Benjamin Graham and David Dodd first textbook on investment research, Security Analysis and The Intelligent Investor. For those of you looking for empirical evidence that value investing works well you are encouraged to review the 50 studies in What Works in Investing available from Tweedy, Browne Company’s website here. They too provide an excellent source of other reading materials on their website. discrepancies without the efficient market theorist’s concern as to whether the stocks are bought on Monday or Thursday, or whether it is January or July, etc.Incidentally, when businessmen buy businesses – which is just what our Graham & Dodd investors are doing through the medium of marketable stocks, I doubt that many are cranking into their purchase decision the day of the week or the month in which the transaction is going to occur. If it doesn’t make any difference whether all of a business is being bought on a Monday or a Friday, I am baffled why academicians invest extensive time and effort to see whether it makes a difference when buying small pieces of those same businesses. Our Graham & Dodd investors, needless to say, do not discuss beta, the capital asset pricing model, or covariance in returns among securities. These are not subjects of any interest to them. In fact, most of them would have difficulty defining those terms. The investors simply focus on two variables: price and value. data are there and academicians have worked hard to learn the mathematical skills needed to manipulate them. Once these skills are acquired, it seems sinful not to use them, even if the usage has no utility or negative utility. As a friend said, to a man with a hammer, everything looks like a nail. I think the group that we have identified by a common intellectual home is worthy of study. Incidentally, despite all the academic studies of the influence of such variables as price, volume, seasonality, capitalization, size, etc. upon stock performance, no interest has been evidenced in studying the methods of this unusual concentration of value-oriented winners. It’s very important to understand that this group has assumed far less risk than average; note their record in years when the general market was weak. While they differ greatly in style, these investors are, mentally, always buying the business, not buying the stock. A few of them sometimes buy whole businesses. Far more often they simply buy small pieces of businesses. Their attitude, whether buying all or a tiny piece of a business, is the same. Some of them hold portfolios with dozens of stocks; others concentrate on a handful. But all exploit the difference between the market price of a business and its intrinsic value. I would like to say one important thing about risk and reward. Sometimes risk and reward are correlated in a positive fashion. If someone were to say to me, “I have here a six-shooter and I have slipped one cartridge into it. Why don’t you just spin it and pull it once? If you survive, I will give you $1 million.” I would decline – perhaps stating that $1 million is not enough. Then he might offer me $5 million to pull the trigger twice – now that would be a positive correlation between risk and reward. The Superinvestors of Graham-and-Doddsville by Warren Buffett if available in its entirety at The Columbia Business School website here. You are encouraged to read it. Over a long period of time the value investing premium can make a huge difference in performance. Results from two of the fifty studies in Tweedy, Browne Company’s publication What Works in Investing will hopefully give you a sense of the potential impact. On page 1-2 citing an article in the November/December 1986 issue of Financial Analysts Journal, “Ben Graham’s Net Current Asset Values: A Performance Update,” Henry Oppenheimer, an Associate Professor of Finance at the State University of New York at Binghamton, examined the investment results of stocks selling at or below 66% of net current asset value during the 13-year period from December 31, 1970 through December 31, 1983. The results: The mean return from net current asset stocks for the 13-year period was 29.4% per year versus 11.5% per year for the NYSE-AMEX Index. One million dollars invested in the net current asset portfolio on December 31, 1970 would have increased to $25,497,300 by December 31, 1983. By comparison, $1,000,000 invested in the NYSE-AMEX Index would have increased to $3,729,600 on December 31, 1983. On page 16 citing a study of results on New York Stock Exchange Industrial Companies according to Price/Earnings Ratios. The results: One million dollars invested in the lowest price/earnings ratio group over the 14-year study period would have increased to $8,282,000. One million dollars invested in the highest price/earnings ratio group would have increased to $3,473,000 over the same period.